China's growing economic involvement in Sub-Saharan Africa and Latin America has been a source of major controversy. The official Chinese position maintains that the growth of bilateral relations is of mutual benefit and provides a good example of South-South cooperation. Critics on the other hand see the economic relations between China and other developing countries as highly unequal with most of the benefits accruing to China and a few local elites. 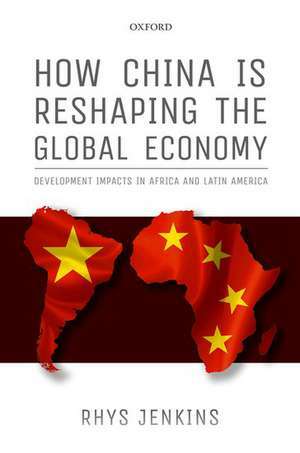 They alsopoint to negative socio-economic, political, and environmental consequences.How China is Reshaping the Global Economy: Development Impacts in Africa and Latin-America throws more light on these controversies through a comparative study of China's impact on the two regions. It looks not just at bilateral relations between China and the two regions but also analyses the changes in the global economy brought about as a result of the shift in economic activity from North America and Western Europe to Asia. How China is Reshaping the Global Economy looks at the factors which led to rapid economic growth in China and the way in which this has affected global manufacturing, commodity markets, the international presence of Chinese companies, and financial glows. It examines the different forms of Chinese economic involvement in Sub-Saharan Africa and Latin America, the main drivers, and economic, social, political, and environmental consequences. It ends with a comparison of the two regionsthat highlights the importance of different histories and political and institutional contexts in determining the impacts of China. Rhys Jenkins is Professor of Development Economics at the School of International Development, University of East Anglia. He has a long standing interest in the socio-economic and environmental impacts of globalisation on developing countries. His recent research has focused on the impact of China on Latin America and on South Africa. He co-edited China and Latin America: Economic Relations in the Twenty-First Century ( German Development Institute, 2009)and has published numerous articles on China and Latin America and China and Sub-Saharan Africa, as well as consultancy reports to the UK Department for International Development on the subject.